Heart strangely warmed…Happy Wesley Day! Happy Wesley day to our Methodist brethren. Of course, we Anglicans love to point out that he was a great Anglican! This joke originated at Cranmer Hall theological college where ordinands train alongside Methodist students in the Wesley Study Centre. The picture of Wesley was taken from our common room for a photo that was being taken. Whilst the picture was gone an Anglican student put a post it note on the wall in its place saying ‘Heart strangely warmed, gone out for Gaviscon’! 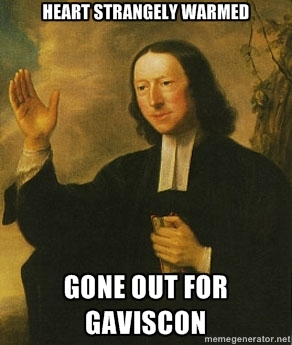 This entry was posted in Memes and tagged Heart strangely warmed, John Wesley, joke, meme, Methodist, Wesley day by masterofthememes. Bookmark the permalink.